A little while ago I rode to Italy and back on the Ducati Mulitstrada 1200 S Touring and as part of the preparation I wanted to take a tankbag because of the extra practicality they offer. I am a big fan of tankbags and have used them all my biking life as they put everything you might need on a regular basis like your wallet, keys, phone and camera handily in front of you. Roll up at a foreign toll booth and your credit card or cash is right there. Mate does something stupid like accidentally drop a lit cigarette down the inside of his own jacket (don’t ask)…so is the camera for hard evidence of his misadventure. You can stash visor cleaning bits, fold up a map…it’s a perfect solution. I have an old Givi tankbag (it’s so old I can’t even remember the name and I am pretty sure it’s no longer on sale) which is fabulous and replaced an identical one which sadly got destroyed in a huge road accident in 2005. There is one small problem, one that meant I couldn’t use it on the Multistrada; it attaches with magnets and the ‘Strada tank is plastic. 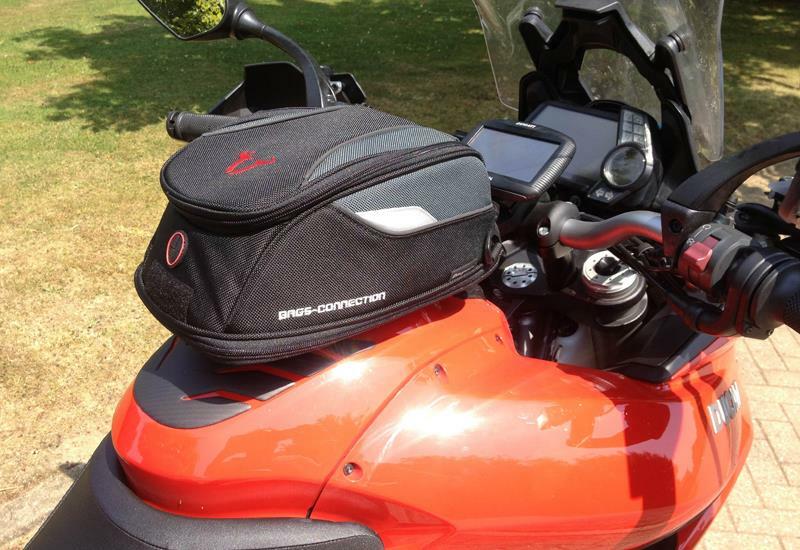 Ducati offered to help with the official 12-litre soft tankbag which has been tailor made for the Multistrada and cost a smidgen under £200. Fitting it was a bit of a faff with buckles that are bolted into the side-mounted bolts of the tank and another which goes under the rider’s seat and bolts to the base of the fuel tank. But it was secure and suited the bike well. It was a big tankbag and that was before it was expanded. However, it quickly became apparent it was in fact, utterly useless as it hid the screen of the official Ducati Garmin Nuvi 350LM satnav. Not just a little bit but completely obscured the screen. I took it off and rode to Italy and back with no handy tankbag. 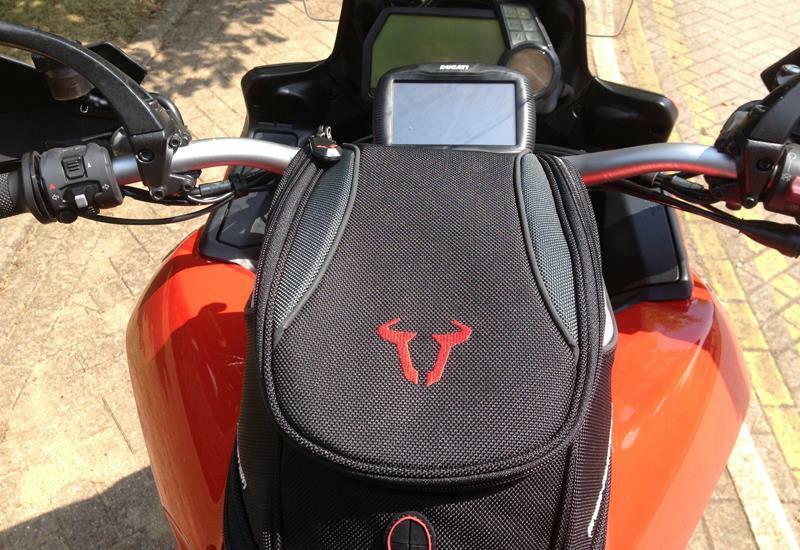 Total price is £105 for both the bag and the mount and it doesn’t hide the satnav. A win. It’s not massive at 5litres but can expand to 9-litres and can pack all the essentials I need for commuting, plus, when I head further afield it offers instant access to the things you need most while travelling. Fitting was easy with the removal of four Allen bolts on the fuel cap ring, a plastic ring then goes on top and four longer bolts with spacers secures it. You then need to work out exactly where the plastic mounting plate secures to the bottom of the tankbag, mark it out using the handy plastic drill template and then using the supplied drill bit you have to drill through the hard plastic base. All you have to remember is to open the Velcro fastening of the nylon lining at the bottom of the tankbag so you don’t drill through it. Fitting took me less than 15 minutes all in and it works perfectly. I may well have another trip across Europe later this year where it will be perfectly suited. 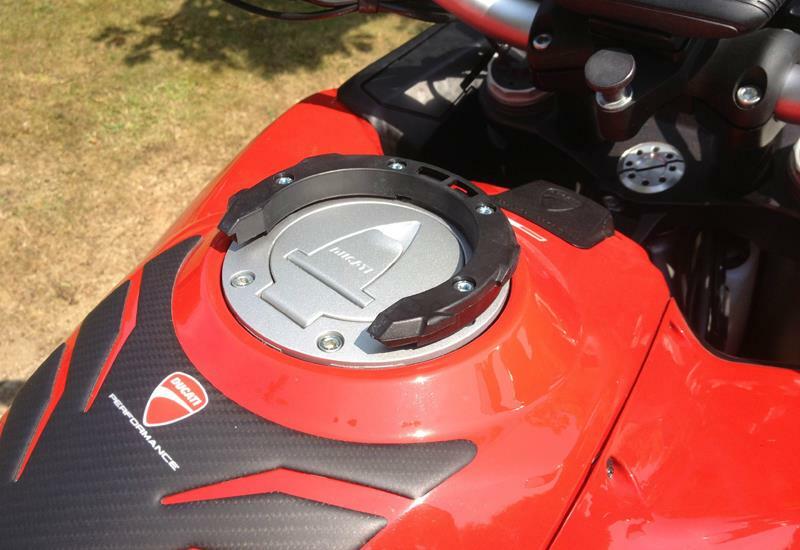 In the meantime it will be perfect for everyday use and I have solved the tankbag conundrum of the Multistrada.